I’m not going to try and pull the wool over your eyes, this recipe is a lot of work. If you lose a little steam along the way, the braised short ribs served with a little bit of polenta would be a fine meal in itself. However, if you want to go the distance to create an elegant and sophisticated meal, you will be blown away by the results. The flavour combination of the savory red wine jus and the rich and tart tarragon buerre blanc was inspired by the proven combination of filet mignon with Bearnaise sauce and red wine demi glace. Making ravioli is the kind of action that really allows you to up your cooking game. You’ll need to make your own pasta if you don’t already. You’ll then realize that the intimidation factor of making homemade pasta is really unwarranted; it is one of the easiest things to do in the kitchen, and you may even stop buying dry pasta. After you make your first ravioli, the creative juices will start to flow and you will begin dreaming up new delicious fillings. The possibilities are virtually endless! Tip: Ensure to roll the pasta dough as thin as possible, since the end result will be double the thickness when you assemble the ravioli. This is the one place where this dish could go wrong, and I’ve made this mistake in the past. 1. Preheat oven to 300 degrees F. Heat a saute pan to high heat, and add a glug of the oil. 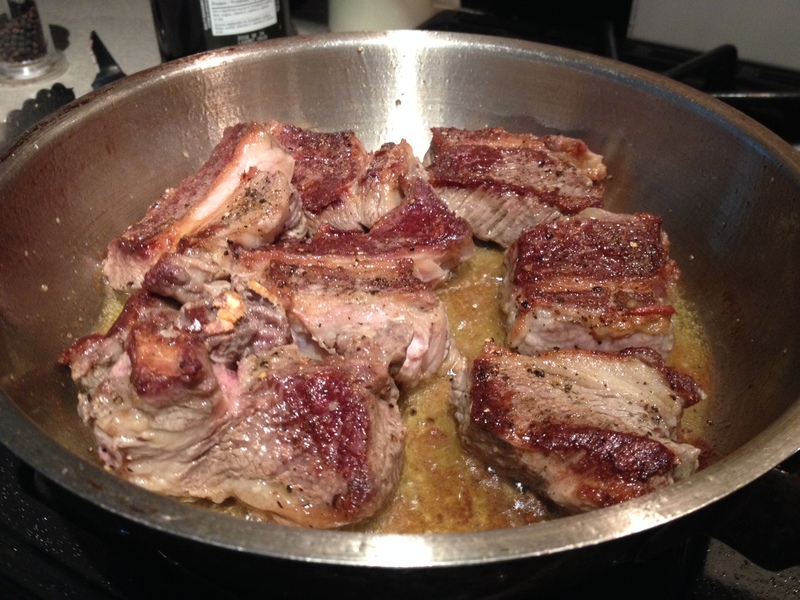 Generously season the short ribs, and sear each side to get some color (about 5 min a side). Set aside and leave pan on high heat. 2. 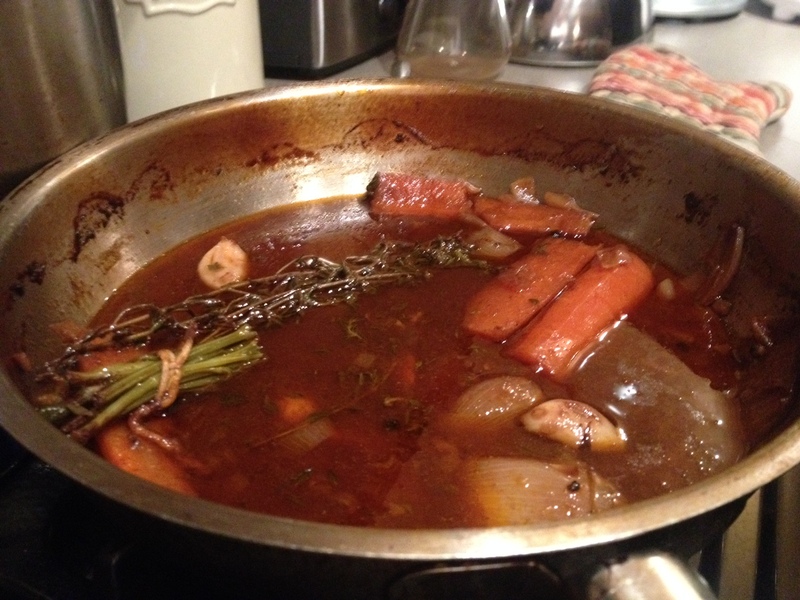 Sear the carrot, shallots and garlic in the hot pan to get some color, then add the tomato paste and the short ribs. Toss everything around while the tomato paste browns but not does not burn, about a minute. 3. Add the red wine and the chicken stock to the pan and deglaze. Add a bundle of the fresh thyme and parsley stems. Turn off heat, cover with tin foil, and place in the oven for 2.5 to 3 hrs. 4. 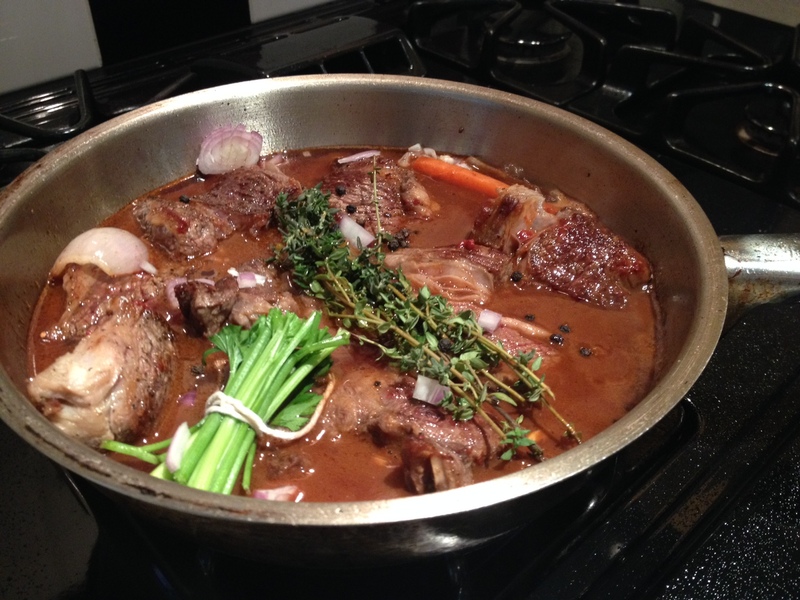 Once done, remove the short ribs from the liquid and set aside to cool. Meanwhile, skim the fat off the braising liquid then strain and discard the solids. Reserve the jus and keep warm for plating. While the short ribs are cooking, make the egg pasta. 1. Brown the shallots with a bit of olive oil, and set aside to cool. 2. Add the short ribs, shallots, parsley, lemon zest, and cheese to a large bowl. Season with salt and pepper, and gently fold ingredients. We don’t want to create a homogeneous mixture, we still want some texture with the filling. 1. Roll out the pasta sheets as thin as possible on a floured surface. Cut 4 inch rounds out of the dough using a mason jar lid. Create a couple rows of pasta circles, top one row with filling, and brush the other with the egg wash. For the filling, create little golf ball size mounds, and gently compress with your palms to remove any air. 2. To assemble, drape the top round (brushed with egg) over top of the rounds topped with the filling. Align the edges on one side, the pinch down firmly to create a seal. Gently lift up the ravioli and hold delicately in your flat palm. With the other hand, work your way around the filling, pinching to create a seal. When you have almost made it around the full circle, retrace your steps to ensure any excess air is pushed out, then pinch the final opening together to fully seal off the ravioli. This will take a little practice, but you’ll get it eventually. 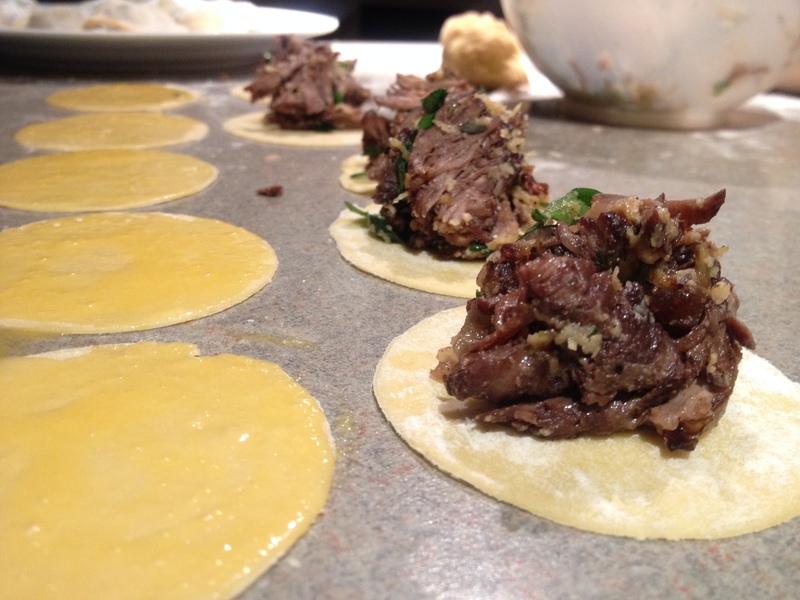 Dust with flour after completing, to prevent it from sticking to the other ravioli. 1. Add the white wine, lemon juice, and shallot to a sauté pan; reduce on medium heat until there is about a tbsp of liquid remaining, then reduce heat to low. 2. Now in the same pan, add the butter 1 cube at a time, whisking to incorporate. Same technique as hollandaise, minus the egg. 3. Gently tear up the tarragon leaves and add to the buerre blanc. Leave on low heat until the pasta is ready. To cook, bring some salted water to a boil and add a glug of oil to the surface to create a kind of oil slick effect on the surface. Add the ravioli one by one, so that they fall through the oil slick. Once they float to the surface, the ravioli is done. Transfer to the beurre blanc pan with a slotted spoon, it’s okay if a little pasta water follows. Gently toss to get an even coating of sauce on the ravioli. To plate, slowly pour the strained red wine jus into the bottom of a shallow pasta dish to create about a 4-5 inch circle. Top with the ravioli and garnish with a sprig of fresh tarragon and some cracked pepper. Enjoy with a nice Okanagan merlot! Nice fusion recipe and great technique. I like the contrast between the braised short ribs and the lemon. Hi Stefan! Thank you! You definitely need something to cut through the richness of the beef here.